Breezing in to Great Yarmouth on the last day of 2011 was an unusual visitor from the south coast of England. Seen at Beach Coach Station mid-afternoon was Brighton & Hove's Scania Irizar 503 (YR58RUH). As the year draws to a close it is time to reflect on what has happened on the local bus scene during 2011. ﻿﻿2011 began with Great Yarmouth's Caister Road depot still using two step entrance Darts on local services but both had gone by the end of February. 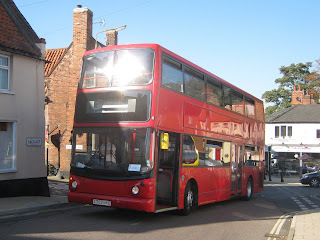 ﻿﻿February also saw Flying Banana Routemaster NML623E moving to Norwich for storage. It re-emerged in July wearing London red colours and working for First Essex at Chelmsford. The month also witnessed the surprise arrival of Dart 46440 (N810VOD) on local duties.After a 4-5 week tour, also taking it to Ipswich and Norwich, it went south to Basildon. 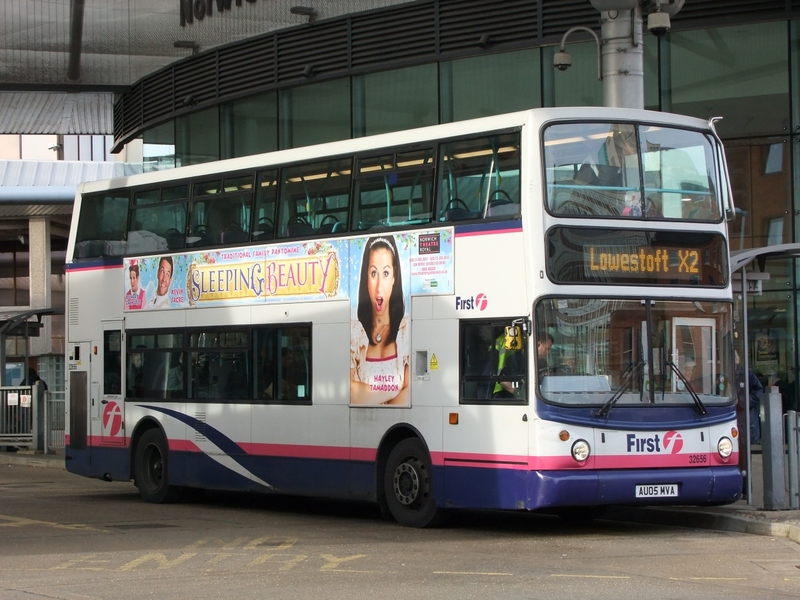 ﻿New timetables were introduced on 27th March and, with the reallocation of ten Volvo B7TL/Presidents from Norwich, the number 8 route became all double deck and low floor operated. Not all went to plan though as three were reported to have expired on their first day! 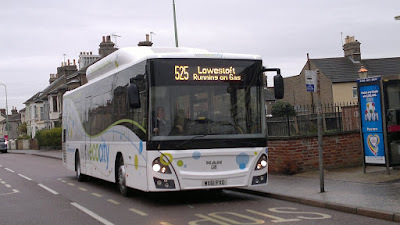 In April, First announced its withdrawl from Kings Lynn by selling its town services to Norfolk Green. 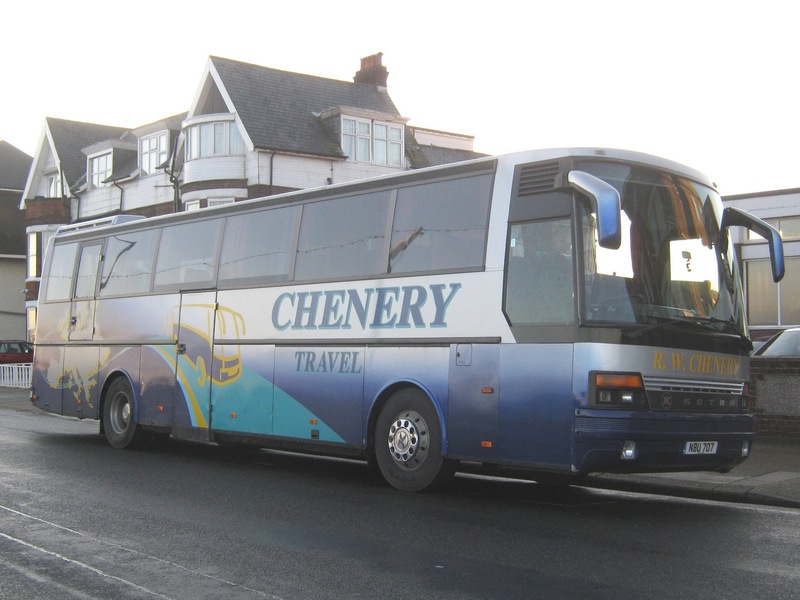 This resulted in Caister Road benefitting from three Volvo B7TLs (30887-9) with a fourth following later. During June four of the new Wright Eclipse Geminis, destined for Norwich, were seen on their journey to Norfolk. Apart from appearing on Royal Norfolk Show shuttles, they were not used again until mid July when they appeared on city routes 25 and 35 following tree lopping. ﻿﻿﻿﻿﻿Also during June the six tri-axles languishing at the rear of Caister Road depot made their last journeys. With the exception of 30097, all were taken for scrap by Earith Commercials. 30097 was preserved by a private buyer from Essex. ﻿﻿Early September saw blue Routemaster SMK717 leave Caister Road on a low loader bound for a Glasgow museum. 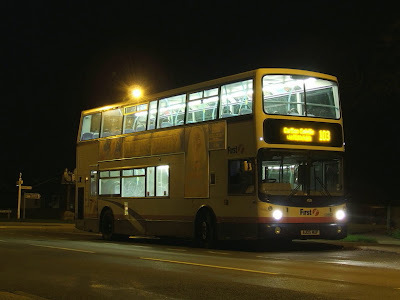 The fleet's last Leyland Olympian 34333 (H132FLX) was finally withdrawn in mid-October; only to see it resurrected a month later for use on Bernard Matthews contracts on the run up to Christmas. Finally, following accident damage to 37156 at the end of November, one of Norwich's new Eclipses (36180) stepped up to X1 duties. Little to report here other than the sale of their sole Optare Tempo to Norfolk Green. It arrived at the latter's Kings Lynn premises during the week before Christmas. 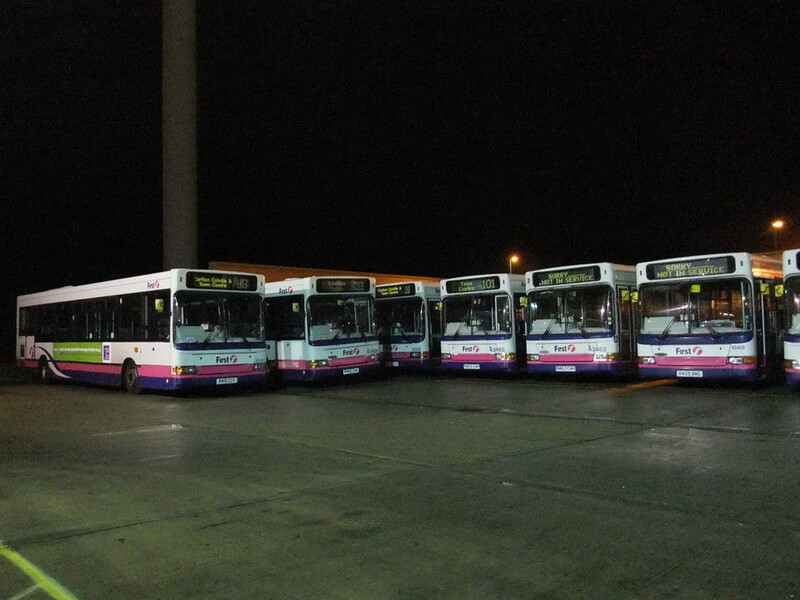 ﻿Anglian took delivery of eight brand new vehicles during 2011 - five Scania Omnilinks and three Optare Versas. 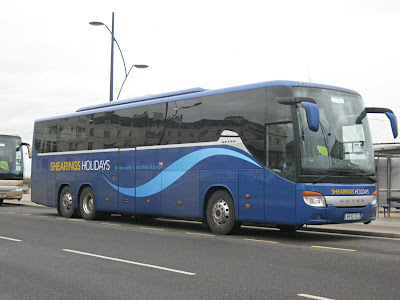 It also acquired five former Stagecoach London Trident ALX400's during August and September. A further Optare Solo was purchased from Veolia during September. 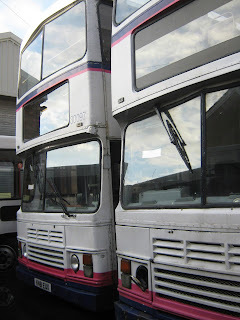 In the opposite direction three former Chester Bus Scanias were sold to Ixworth-based Mulleys and were re-registered. 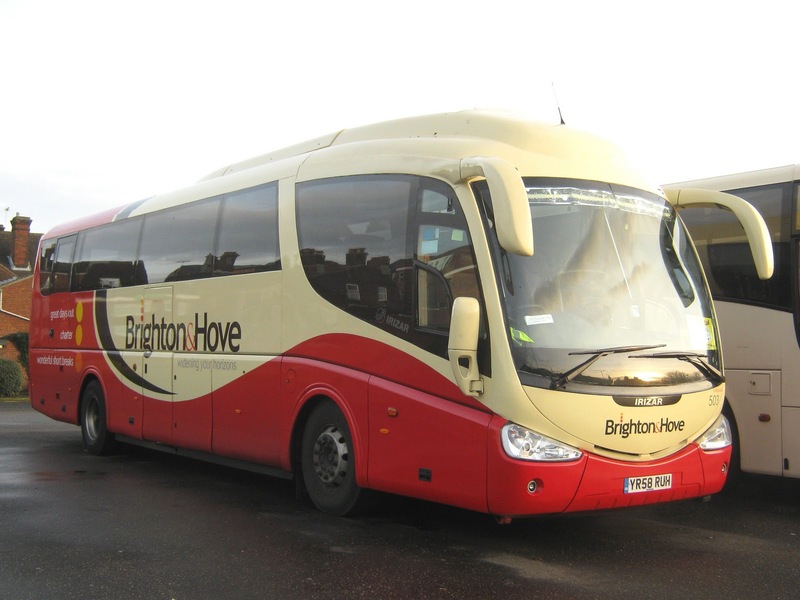 Konectbus evaluated a Brighton bendybus in late March on city services. It must have been a success as the Dereham based business took delivery of three of them from Go Ahead London in October with more following towards the end of the year. All five new Alexander Dennis Enviro 400's arrived before Christmas ready to enter service in the new year on the new konectexpress 8 service. Norse sold six of its Agoralines to Norfolk Green during May. In the same month one of their Tridents caught fire whilst on the Postwick Park and Ride. 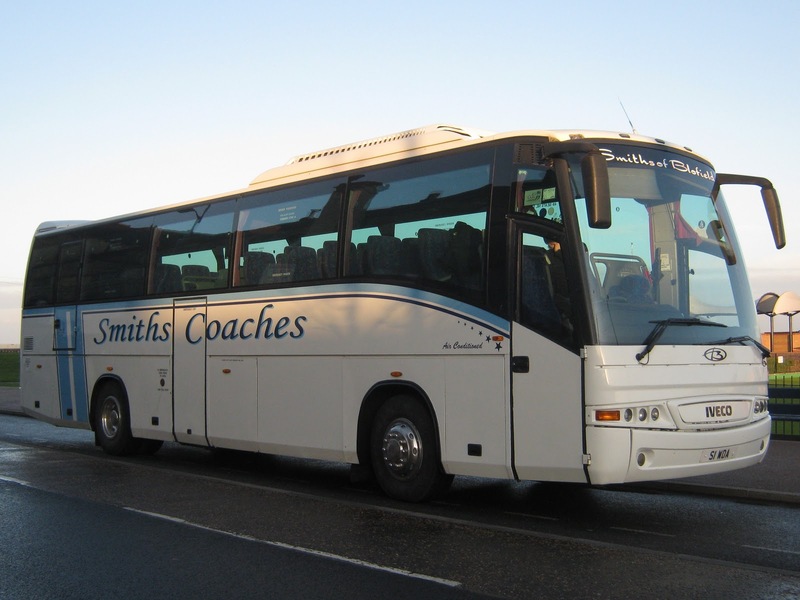 In June Reynolds Coaches received Mercedes Benz BX55FYO from Clarkson of South Elmsall and it was immediately pressed into use on schools services. 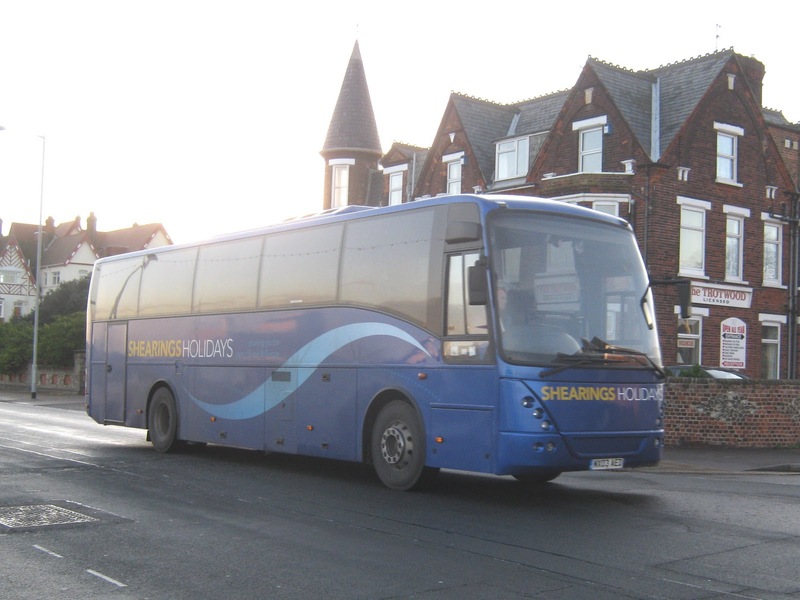 In the following month the Caister-on-sea operator unveiled its rebodied and repainted Van Hool BEZ3139. It also launched a new website during the summer. 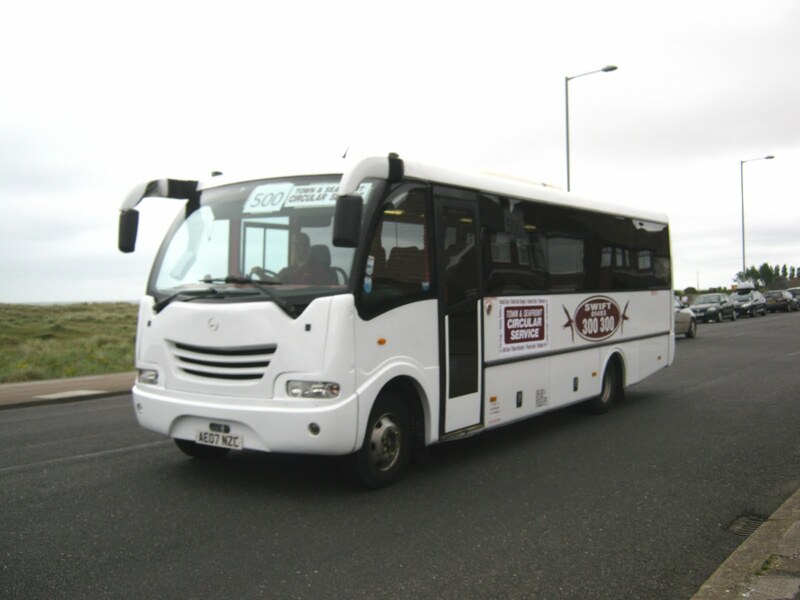 With First Eastern Counties terminating its Service 3 at Market Gates, Swift introduced a seafront service during the school summer holidays. The hourly service was provided by their Mercedes Vario AE07NZC. Surprisingly, during August, Bedford-based W & H Peacock auctioned off ten of Swift's vehicles. It is believed that the reduction in school contracts and services led to their disposal. 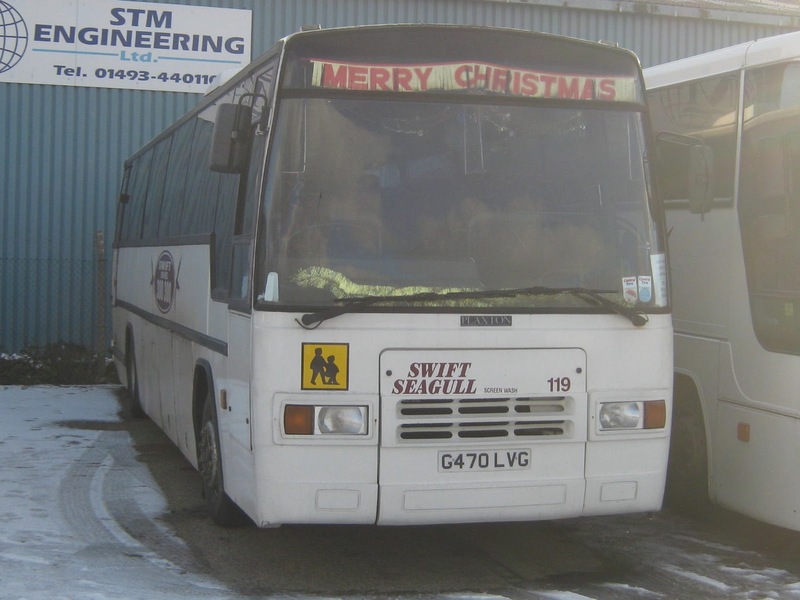 On the positive side, however, Swift did gain a former Wallace Arnold Volvo B10M (491JVX) which was noted on schools' services during October. ﻿﻿Finally, I would like to express my thanks to all the regular contributors to the blog. Please keep the reports coming in. I would be pleased to hear from new contributors too. Quite a number of visitors have been seen in the Great Yarmouth area over the Christmas Day/Boxing Day period; three Shearings coaches have been amongst them. Observed on Marine Parade in Great Yarmouth during the afternoon of Boxing Day were 109 (BK09RNF), 229 (BF10VCZ) (pictured above) and 509 (MX03ABF). Their passengers were enjoying their stay at the nearby Carlton Hotel. 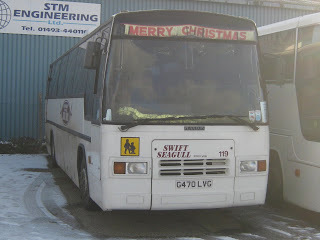 East Norfolk Bus would like to wish readers/followers of the blog a merry Christmas and a happy new year! I tentatively started the blog in early January of this year and initially thought that I would run out of things to say and photograph within weeks - how wrong can you be! Thanks to the support of Grahame Bessey, Syd Eade, Stephen Gowler, Tim Major and Mark P in particular for their photos and information, it has continued to be the success that it is. The number of page views and the countries of origin have been quite staggering! My thanks also go to Andy of Andys Bus Blog and Joe of Norwich Bus Page for their support and encouragement too - check their blogs if you haven't already! Yesterday saw a visit to Norwich for some last minute Christmas shopping. It also provided the opportunity for some more pictures! Coach Services Scania YN04YJA followed closely behind displaying 'CS66 Stanton' on its destination screen. Apologies for the poor quality photo - I will get the sun moved next time! Anglian's new Scanias also had a presence on St Stephen's Street with 439 (AN61LAN) prepared to head off to Bungay on the 588. With all my shopping and business completed it was time to head for home. There was, however, a surprise to come. Having tried to get a picture of Anglian's on hire gas bus without success during the past fortnight (especially on the 601s last week! ), I stumbled across it whilst it was waiting in the queue of vehicles at the lights in Surrey Street. A dash across the other side of the road enabled me to get the reasonable picture. Anglianbus loanee WX61WFO at Surrey Street heading for Bungay 'running on gas'! First Eastern Counties operates its 6B service between Market Gates Bus Station and Belton via Bradwell and Mallard Way on Mondays to Fridays during school and college days. It comprises an 08:00 Belton to Great Yarmouth and a 15:20 return from Market Gates. Surprisingly, as schools have finished for the holiday period, it was operating again yesterday afternoon despite the timetable indicating that it wasn't! 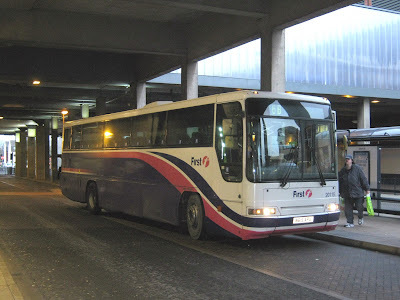 Instead of the usual double decker, the handful of passengers were treated to the delights of a Volvo B10M. Above First's 20115 (N615APU) is photographed prior to its departure from Market Gates. 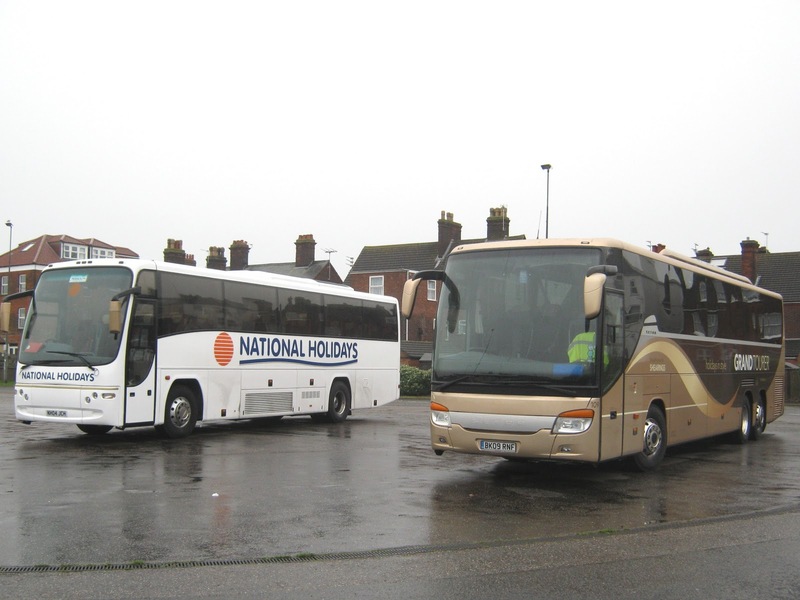 A call into Great Yarmouth's Beach Coach Station at around 2.15 yesterday afternoon coincided with some busy activity. 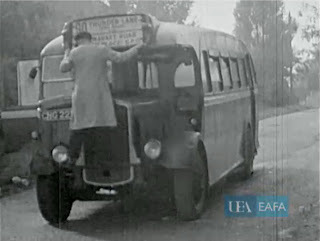 ﻿Regular contributor Syd Eade has drawn my attention to a film appearing on the University of East Anglia's Film Archive website showing Eastern Counties Omnibus Company activities during 1947. Entitled A Busman's Day, it begins by showing the Social Club Committee sitting around a table having a discussion and includes some close up shots of some of its members. People catch a bus at a suburban stop (by a public house) and there are shots taken through the window as they drive towards the bus station at Surrey Street. We see the bus arrive here with other buses in view. One bus is started using a starter handle. Another is a self-starter. Mechanics work in the garage and a selection of destination boards are shown. The next sequence shows the buses and busmen at Thorpe Station, which was a major terminal at the time. There are scenes from Orford Place, showing the busmen outside their social club and buses passing through. In the social club, the takings of the savings club are counted. There is a shot of the ledger showing proposed payouts for holidays in 1948. The film ends by showing the large crowds of people waiting to catch a bus at the Surrey Street Bus Station on August Bank Holiday Monday. A trip to Great Yarmouth on a cold sunny afternoon began with a ride on one of Anglian's 57 registered Scania deckers from Gorleston High Street. I sat on the bottom deck which was decorated with Christmas trimmings! 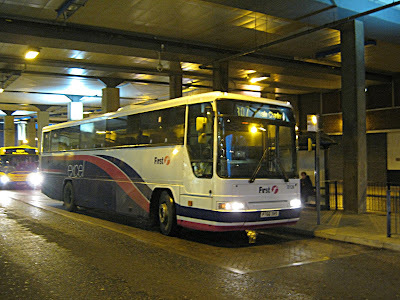 On arrival at Market Gates, I was met by what appeared to be an abandoned Setra oustside the Troll Cart public house. It was EDZ114 of Norwich-based Avanti Coaches and minutes later I saw one of Chenery's coaches (NBU707) arrive with a fitter/driver (?) who immediately set to work on it. 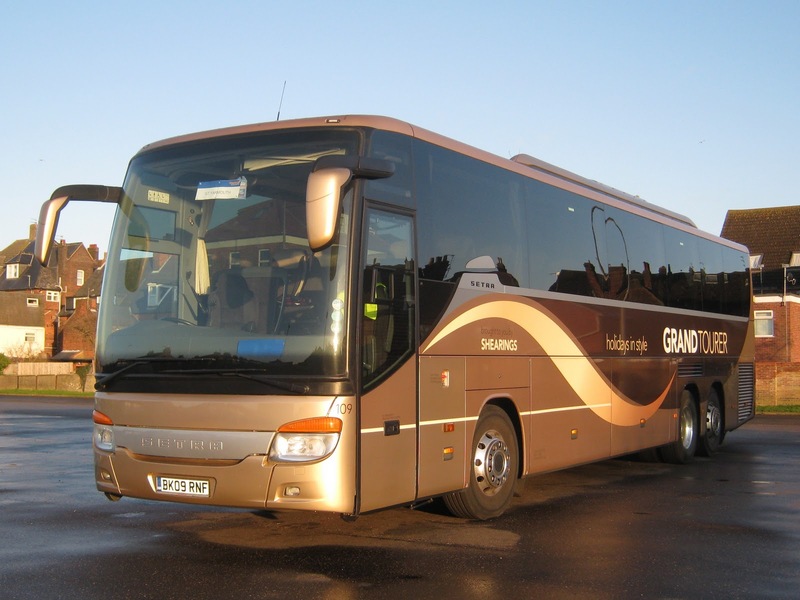 I then visited Beach Coach Station where Shearings Setra 109 (BK09RNF) was enjoying the wintry sun in Grand Tourer livery! Next a walk to the seafont and I passed two coaches outside the Raynscourt Hotel on Marine Parade; Abbey Travel of Hull's YIL3202 and A11WEY of Allways of Isle of Sheppey, Kent. The coach layby near the Britannia Pier was occupied by Smith of Blofield's Setra S1WDA - thought to be on a schools trip to the Marina Centre. I then returned to Market Gates Bus Station for the journey home and saw First Eastern Counties Volvo B10/Plaxton Premier 20126 (P766XHS) being readied for its next duty following contract work. 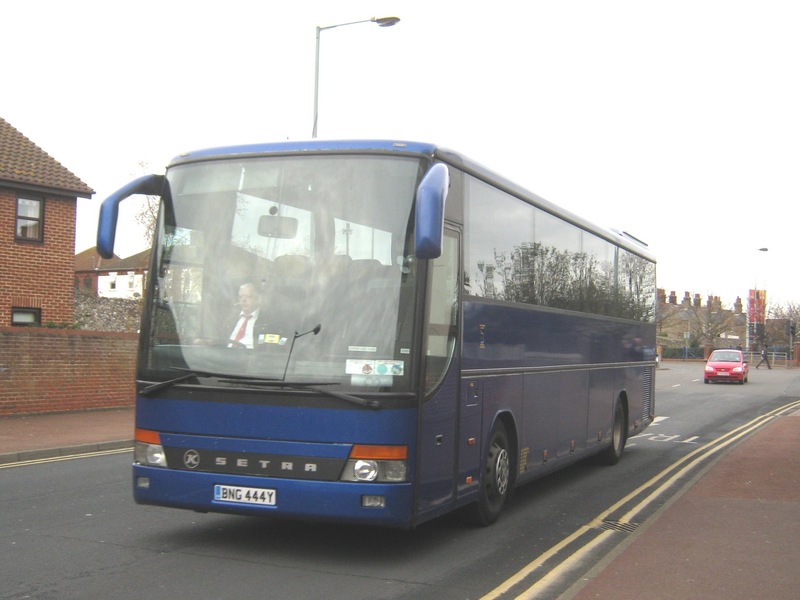 Beccles - based Anglian Bus operates two services through Gorleston, a major urban part of Great Yarmouth. As expected they both serve the main shopping area of the High Street. The first appearance of Anglian vehicles in Gorleston was with the introduction of its hourly interval A47 route linking Gorleston and Great Yarmouth with Norwich via the A47 road. 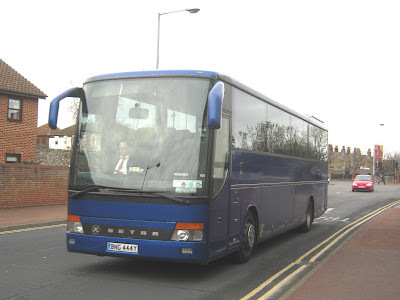 Normally provided by a Beccles based vehicle, the service was worked by one of the new Rackheath 61 registered Scanias during yesterday lunch time. 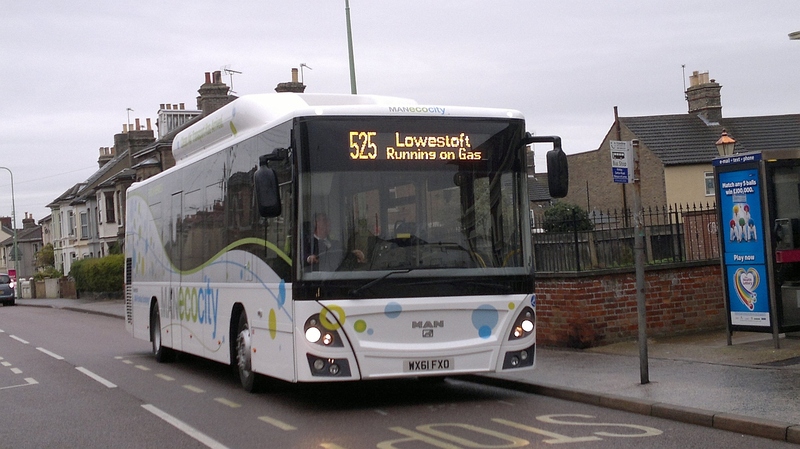 The 601 service connects Great Yarmouth with Lowestoft via Gorleston on an half hourly frequency with some services continuing on to Southwold. Above one of the former Stagecoach London Tridents is seen in Gorleston High Street destined for Southwold on the 601 route. My main reason for visiting Great Yarmouth this afternoon was to photo Anglian's loaned gas bus on the 601 service between Great Yarmouth and Southwold, but I was unsuccessful! However, in between the scheduled 601 services I visited Beach Coach Station - again I drew a blank as no coaches were on site. 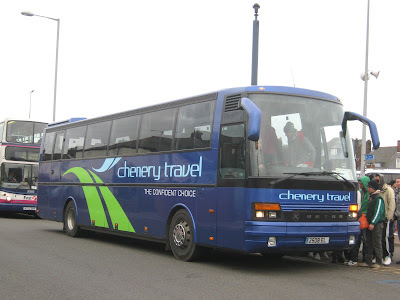 However, as I backtracked to the town centre a Chenery's Setra was driving towards me northbound on Nelson Road North. On noticing his passengers were on the opposite side of the road, he quickly reversed into a side road to turn to face the right direction! Grahame Bessey recorded W61FXO on the 525 earlier today at Lowestoft's Carlton Road. Regular contributor Grahame Bessey spent a few hours in a chilly Norwich on Monday to catch up on recent developments. 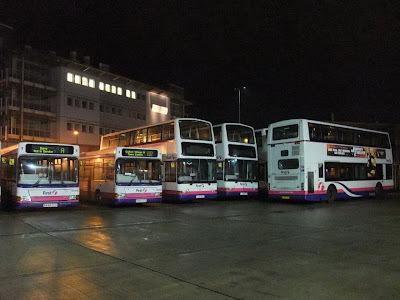 Following First's recent transfer of ALX 400s onto X2 servies (as already report here) Grahame photographed 32656 (AU05MVA) waiting to depart for the coast at Norwich Bus Station. Also present at there was Chenery's Volvo B9 FJ11MKC awaiting its next duty; the 490 London service. 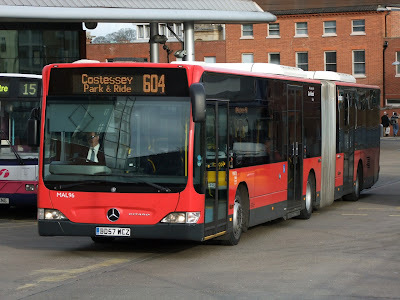 Konect was seen using one of its Merceded Benz Citaros on the 604 Costessey Park and Ride. BD57WCZ was still sporting its London red colour scheme. 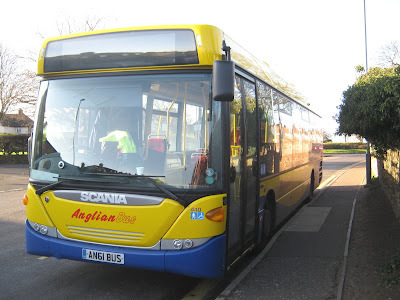 Two of Anglian's new Scanias (﻿AN61BUS and AN61AVK) were being employed on the 123 route between Norwich and Wroxham. Unusually for a Monday afternoon, I took a trip into Great Yarmouth and found a number of visiting coaches present around the town. At Beach Coach Station there was just the one solitary vehicle present and that was National Holidays Setra 163 (NH09PRH). She didn't stay long as when I passed two hours later she had gone! With the light fading I headed south along Marine Parade towards Wellington Pier. Outside the Carlton Hotel were two Shearings Setra coaches. One of them, 206 (BK10EJG), was languishing in the winter sun in the car parking area. Meanwhile, 130 (BK09LUY) had just arrived at the hotel and its luggage was being removed when I photographed her. The latest issue of Bus & Coach Preservation includes an article by David Jukes on the restoration of two of Lowestoft's double deckers. 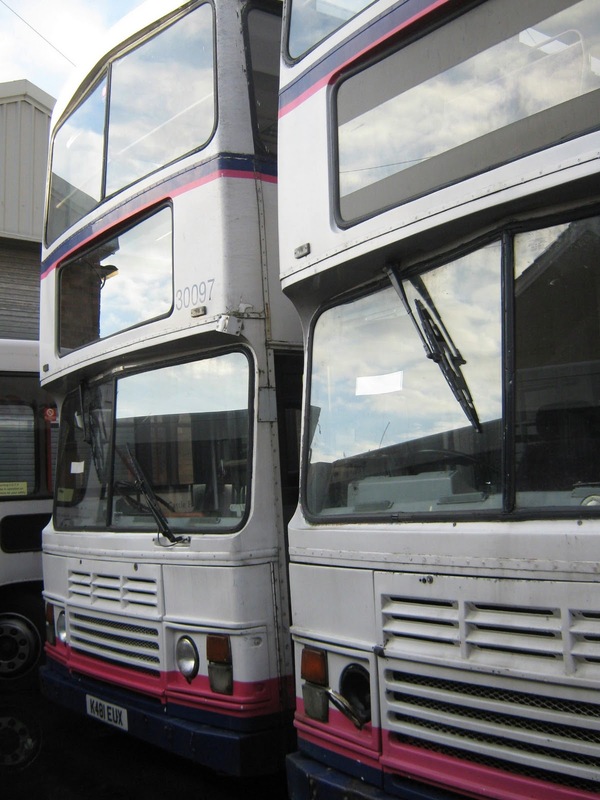 These are the privately owned Leyland PD2A No 12 (PBJ2F) and East Anglia Transport Museum's AEC Regent No 8 (918NRT). In a second article John G Lidstone looks at Southend's ex-London wartime Daimlers and meets the sole survivor 263 (GLX913) on its return to Essex. The Volvo B7s/Plaxton Presidents acquired from London have not been a success on the X2 Lowestoft-Norwich service with reliability being poor. So on the evening of Friday 2nd December five of them were replaced with ALX400s 32651/2/4/5/6(AU05MUO/P/W/Y/VA). Presidents 32212/3/4 (LT52WTV/W/X) went direct to Norwich and 32207/8 (LT52WTN/O) should now be at Great Yarmouth's Caister Road allowing the shorter length 32100/101 (LT02ZCJ/K) to return to Norwich. 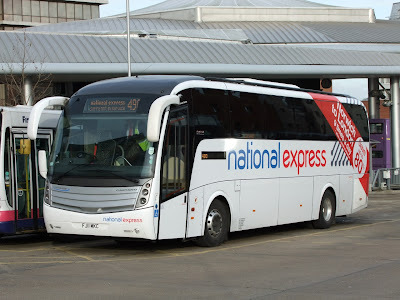 This afternoon I travelled back from Great Yarmouth via the golden mile (Marine Parade) and saw a National Holidays' coach unloading passengers outside the Carlton Hotel. I identified it as one of their Volvo B12M's - 564 (YJ03VNA). My photo shows the Volvo leaving the hotel bound for its night's stay at Beach Coach Station; the only resident there when I passed later in the afternoon. 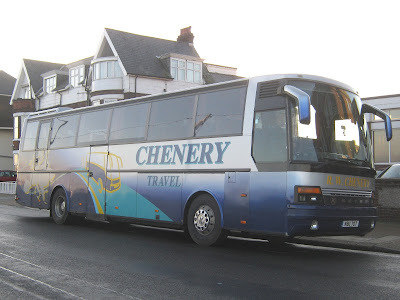 Early this afternoon I observed two Chenery coaches in Great Yarmouth with the first being Setra BNG444Y. 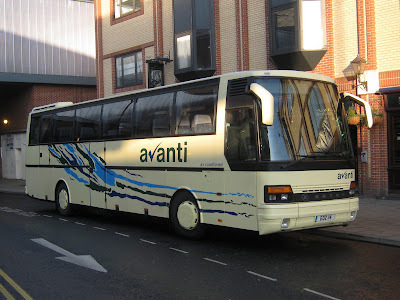 It was completely devoid of any fleetnames and could only be identified through its legal lettering. It looked as if had recently undergone a repaint. Arriving at Beach Coach Station at around 14:10, I was greeted by a convoy of four vehicles heading south along Nelson Road North. At the front of the procession was another of Chenery's Setras; this was 2508EL on a workers' contract. Following immediately behind were three First Eastern Counties buses - Volvo B7TL 30888 (W743DWX), recently reprieved Olympian H132FLX and 34112 (W432CWX). A couple of minutes later a fourth First double decker arrived in the form of 34110 (W437CWX). All four picked up workers at the coach station destined for Bernard Matthews. As the first day of December arrives everyones thoughts turn to Christmas. So I thought I would use Silent Night as the title to illustrate the latest set of pictures sent to me by Syd Eade. The photos were taken in the very early hours of the morning and reflect a period of quietness not usally seen at bus depots during the normal working day. The scene is early Tuesday morning 30th November at Lowestoft's Gasworks Road Depot. 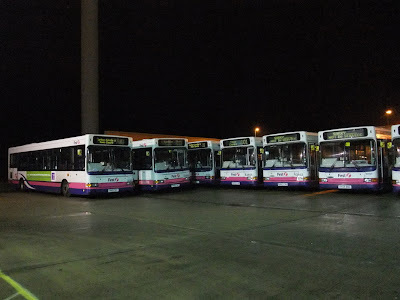 The second picture shows a line up of Lowestoft's Dennis Dart SLFs all with Plaxton Pointer bodywork. Finally another Dart this time it's 42447 (R447CCV) undergoing attention in the workshop.